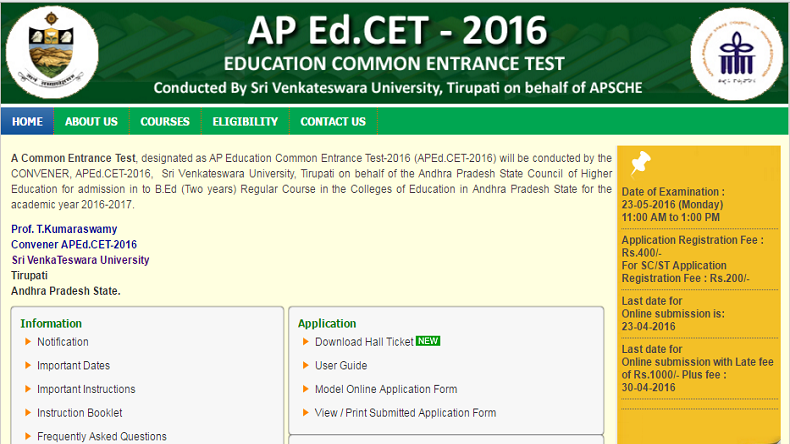 Tirupati: Andhra Pradesh Education Common Entrance Test (AP Ed. CET) results 2016 announced today. As per reports, apedcet.org will publish the results online in Thursday, 2nd June. The candidates who have appeared for the examination can now check their results on Sri Venkateswara University official website. AP Ed. CET 2016 examination was held on 23rd May from 11 am to 1 pm which was appeared by 11 thousand candidates. 2. Click on ‘AP Ed. CET Results 2016‘. 6. Download your results and take a print out for future reference. Sri Venkateswara University, named after the Lord of the Seven Hills, came into existence as a teaching and affiliating University on the 2nd September, 1954, to promote higher education and research in all branches of learning. It was intended to fulfill the long felt need of the people of backward region of Rayalaseema for their educational advancement.